The Crazy Horse Memorial is located in Crazy Horse, South Dakota in the heart of the Black Hills, the sacred lands that the Lakota call PaSapa. The Crazy Horse Memorial began on June 3, 1948, when Lakota Chief Standing Bear, who asked world renowned sculptor Korczak Ziolkowski to carve a figure of Crazy Horse in Thunderhead Mountain, started a charge of dynamite that led to the beginning of the world’s largest rock sculpture which is still being carved. The Crazy Horse carving is being done in three dimensions. It is 563 feet high, taller than any other monument built in history. 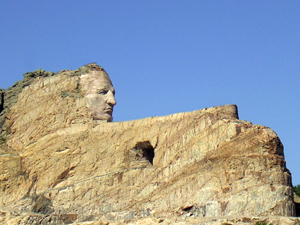 Crazy Horse’s face was finished on June 3, 1998. Ziolkowski worked virtually alone for the first five years working out the different measurements and dimensions of the sculpture.